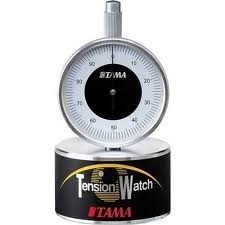 The Tama Tension Watch will take pressure readings from the surface of your bass or tenor drum. This will allow an even tension across the head in order to provide a clearer, more definite tone. This tool will enable your definite pitch drums to maximize and maintain the most consistent tone when it counts the most. The Tama Tension Watch offers a more durable design than its competition, and will stand up in field use and inclement weather at the games and parades.